We can call them errors, missteps, gaffes or outright screw-ups, but whatever you prefer to call a social media crisis, it can be a catastrophe of epic proportions for your company. Ever wonder about the definition of a social media crisis? In a 2011 article from SocialMediaToday.com, writer Tia Fisher notes a report by a social media strategist, Jeremiah Owyang, that began with this definition: "A social media crisis is a crisis issue that arises in or is amplified by social media, and results in negative mainstream media coverage, a change in business process, or financial loss." The most recent social media crisis that came across my computer screen was American Apparel’s Tumblr post over the Independence Day weekend. The company posted a photograph of the 1986 Challenger explosion with the tags #smoke and #clouds. A predictable, angry backlash ensued, and the company took the photograph down and apologized. 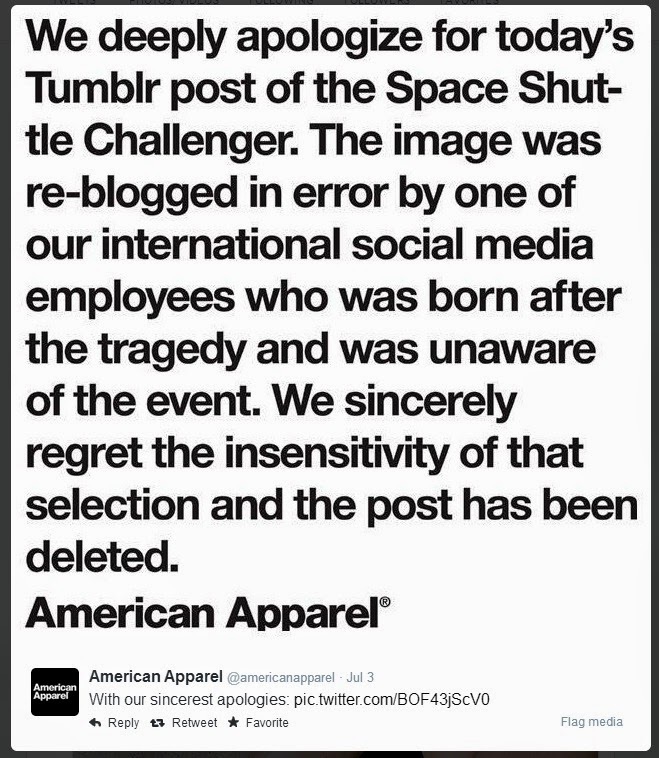 According to the apology from American Apparel, the photo had been posted by a millennial who was “born after the Challenger tragedy” and was, it implied, unaware of the event. Few people, including myself, found that to be an acceptable apology. I was born after the bombing of Pearl Harbor, and the Holocaust, but still can instantly identify images from those world tragedies. The incident – which was not the first social media blunder the company has made - prompts a few critical questions: What is a social media manager? Who are these social media managers and what do they do for a company’s brand and reputation? The answers to these questions can be a great help in avoiding a major social media calamity. Let’s think about what a social media manager does. First, don’t assume they’re just playing on the Internet all day. A qualified social media manager should be able to design a strategic social media plan for your company or, at the very least, carry out the demands of one already in place. Following consumer sites or business-related web pages for your company’s reputation management is crucial, as is setting up your company’s and your employees’ public profiles. Tracking trends and compiling analytics to measure your social media’s return on investment (ROI) also is an essential function. For a well-rounded description of a social media manager’s job, this article by Lauren Mikov for SocialMediaToday.com is excellent. A social media manager should have some credentials and not just be the VP’s tech-savvy nephew. He or she should be experienced enough to know they have to research the information and images that they’re posting on behalf of the company on the networks strategically chosen to reach your clients. More and more, companies are seeking a social media manager with specific criteria, such as a background in marketing and public relations. This article by Jerry Low for SocialMediaToday.com gives some great tips for any hiring manager to review before offering a candidate a job. Kathi Kruse, an automotive social media marketing expert and owner of KruseControlInc.com, has some scrutinizing questions to ask in an interview with a potential social media manager that delve into the appropriate answers you should receive. On the flip side, Hollis Thomases, President & CEO of Web Ad.vantage writes for Inc.com giving a list of things not to do in your quest for that special someone to manage your company’s social media strategy. There’s an old saying attributed to Ray Kroc, founder of McDonalds, “You’re only as good as the people you hire.” That saying is as important for the marketing and PR industry as anywhere else. Mistakes will happen; but ensuring that the millennial you’ve tasked with the job of managing your social media is qualified, experienced, and knows your marketing goals will help any company keep the crises to a minimum. Who Has Your Company’s Twitter Password?